Wholesale packaging supplies of brown and white kraft paper bags, carry, gift, satchel, cello, organza and flat bottom bags. * Half cartons available, incurs 25% surcharge. Same width as a boutique bag, but taller. This is the bag to fit most of those awkward items! Same width as boutique bags, but taller. This is the bag to fit most of those awkward items! Plain & coloured calico bags. Reusable shopping bags are a simple way to help the environment. 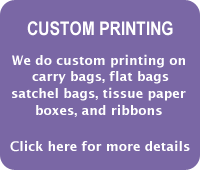 Small run personalised printed calico bags also available. 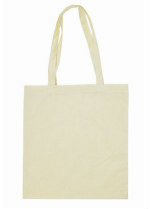 Jute laminated carry bag with cotton sides and cotton padded handles. Small run personalised printed jute bags also available. WHITE high gloss satchel bags - 80gsm. Gloss finish ideal for jewellery and various accessories. EPI 100% degradable plastic. All bags have the epi logo on them. These bags are not cellophane. They are heat sealable. To seal the bags we suggest using twist ties as these bags are not self-adhesive. CBG204x100 Clear cello bag: 25um with side gusset. White paper outside (with peal and stick flap) & poly bubble inside.